Do you need a sign? Here’s my favorite technique to receive guidance from your invisible teammates. Are you facing a crossroad? Have you been considering a couple of choices and both seem to be good for you but you need to make a move and don’t know which way to go? Are you afraid to make a mistake and choose the wrong option? First of all, consider this: What if you couldn’t make a mistake? As an Intentional Creativity® facilitator, one of the powerful teachings I share with my clients is that there is nothing you can do wrong. You can’t choose the wrong color, the wrong paintbrush, and you can’t paint the wrong strokes. True that your inner critic will try to convince you otherwise, doesn’t mean it’s right. By "trying on" this new way of operating, you learn to quiet down the Inner Critic and turn your attention to your Inner Compass to receive guidance. ​to see new perspectives which you then bring in your every day life. Second, if you believe that you have a large invisible team of beings ready to offer support, you can ask them for specific signs to help you in your decision making. I’ve used this technique many times and when I had the courage to follow through, I haven’t been disappointed. The special trick to this technique is that it needs to be specific. Ask to see something specific that you wouldn’t expect to see and within a time frame. For example, my daughter was hesitating between 2 majors in College. She felt that she was receiving signs that guided her both ways, but she had to make a choice. So I taught her this technique. And just to be clear, we were on a 12 hour road trip in the middle of winter in Canada so the chances to see a butterfly were zero to none. Well, within 4 hours, she was watching Netflix on her phone when she saw 2 butterflies on the wallpaper in the background of the scene. And after that, it was a butterfly sign after the other. She said she’s never seen that many butterflies in such a short period of time, not even in the summer. She had her answer. She changed her major and she is sooooo happy she did. She feels so much better and she is so enthusiastic with the possibilities. If you think that you see the signs because you’ve asked for it and therefore your awareness is just heightened to see these things specifically, I can tell you that often, when I desperately wanted to see the sign I was asking for, I didn’t see any. I was looking hard but it just wasn’t the time to choose that option. If you don't receive the sign that confirms option A, try the same technique to see if option B is the best choice. If you don't see signs that confirm Option B as a good option, maybe it's time to explore other avenues and wonder about new possibilities. I have some tips to do so but it will be for another post. Try out this technique and let me know about your experience, I would love to hear! Who is on Your Team in this Grand Adventure of Yours? Being aware of your thoughts and feelings is empowering, but even if you live your life aware and awake, you still get stuck in old stories, fears, and self-doubts once in a while. The gift is that now you know what is going on. However, sometimes, it's more difficult than others to shift your inner conversation on your own. That’s why it’s crucial to have a couple of people who you can turn to, to whom you can freely ask what you need at that moment. Sometimes, they can just be a space where you can be sad, where you are heard and witnessed. Sometimes, they can help you remember who you really are and what you are up to. Sometimes, they can help you to see a new perspective on a given situation. I invite you to assess who is on your team to shift your energy faster. Then, contact them and create the space between you two where you commit to ask for what you need and to be there to empower each other. It’s an opportunity to create a new kind of relationship with yourself and these special friends. Share about your intention and what you want to create with them. By doing this, you then become the deliberate creator of your life. If no one around you can fulfill your need of an empowering teammate, call one into your life. Use the Universe to support you in attracting the person you need. While that person is preparing to come into your life, do what's in this blog post: What to Do While the Universe is Orchestrating the Manifestation of Your Dreams? How do you prepare for an adventure? ​Are you someone who need to make lists and plan for months before going on a trip or while working toward a dream? Are you trying to be FULLY equipped and ready to take on EVERY possible challenge that MIGHT show up? If so, you might find yourself feeling stuck in the planning and packing and never go where you want to go and do what you want to do. You might also feel that a paralyzing fear of not being ready or missing something or of the unknown. Maybe you are someone who packs light and is ready to go at any time on the new adventure calling, the new shining thing/opportunity presenting itself. You are curious and might be addicted to adrenaline or the excitement of the new beginning. If so, you might get lost along the way, finding the shiny new beginning not so shiny anymore and losing interest. You might start wondering why you are going where you are going and doing what you are doing and then follow the next shiny opportunity which makes you spread yourself thin and forget about who you are and what you are about. 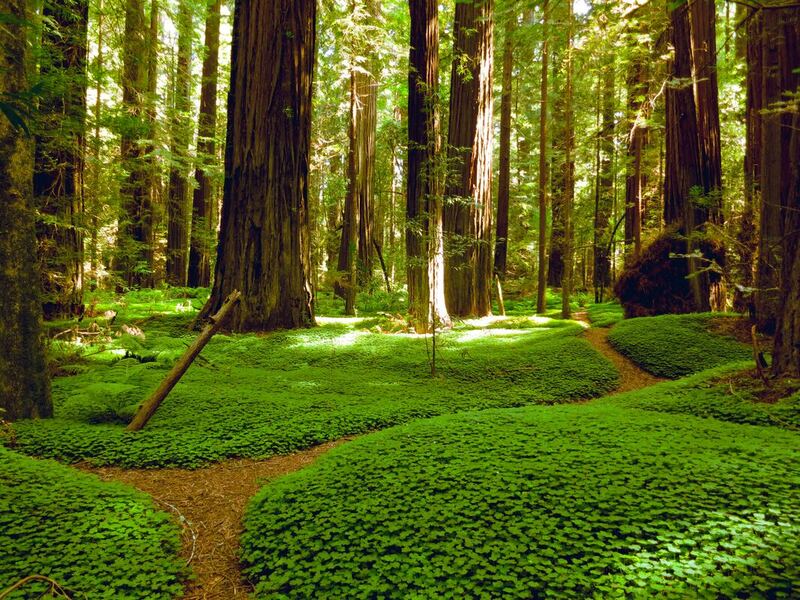 Or are you the kind of adventurer that regularly checks with your inner compass to see not only which journey is calling but to see which path is yours to step on? You pack what you need as well as your gifts and talents because you know what they are. You know about the mystery, and the unknown and you also know that you are not alone, you have access to guidance and you always have your inner compass to refer to when you feel lost. So what kind of adventurer are you? Personally, I am a little bit of all of them, I travel on the path, then I go on the side looking in, wondering if the path is right, doubting, feeling not enough. My fear of not being enough makes me take classes after classes to know more, to be better, it also makes me hold back and stay in my comfort zone. It makes me not step fully on the path but walking very alertly and on the side of the path looking in. I am also very attracted to anything shiny and glittery so I can get easily distracted. But then, when I connect with my inner guidance, my fire gets awakened ,and I am back on the path trusting, witnessing the synchronicity, being grounded and open to new insights, new perspective,s and magic. It feels pretty darn good there! Honestly, knowing yourself is immensely helpful. Knowing how you think, what stories are operating in the background that influence the decisions you make, the actions you take, and how you show up in the world is invaluable when living an intentional life. Are you the adventurer you would like to be? What do you need to put in place to become that adventurer? What adventure is knocking at your door? What has been calling you to bring into reality? What have you been putting off that is time to feed, nurture, and give space for? What is ready to be birthed through you? Or maybe, you have been on your path but feeling stuck and you don’t feel the fire you once felt? Hopefully, this article will help you get to the next step of your journey. January is such a great symbolic time representing a new beginning, new possibility, and new potential. It’s that time of year… at least in the north when the pace slows down so you have time to do some dreaming and visioning, to take a breath and assess where you are, where you want to go and make a plan to make it happen. It’s a time to make some adjustments if you’ve been walking on your path but are feeling down… what do you need to do to rekindle the spark? Step 1 Vision into the future. What does your amazing future self do five years from now? One year from now? You can make it a very elaborate experience and prepare a ritual before going into your visioning or it can be very simple and just take a few deep breaths and set your intention to go on this journey to meet you awesome future self. 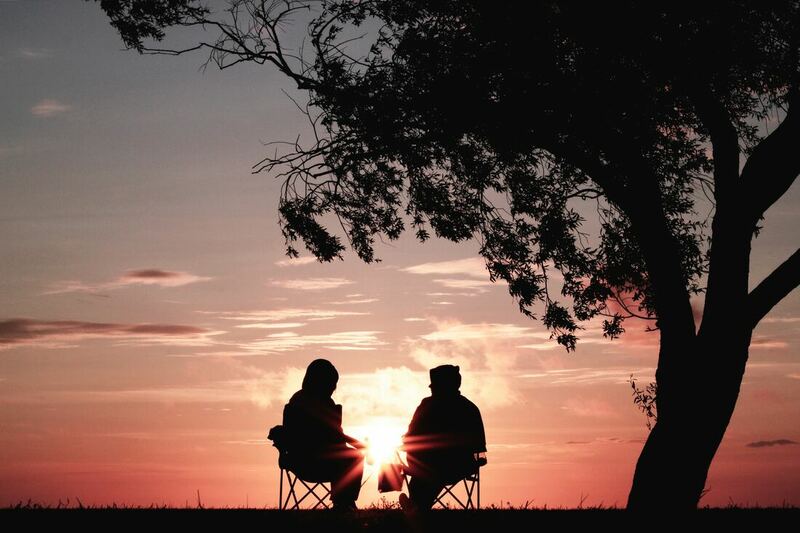 No matter what you choose to do what I recommend is to not only connect with your self, living an extraordinary life but merge into her so you can feel how it feels to live that life and to BE in that life. You want to bring that feeling back in your present. As often as possible, reconnect with the feelings of your fulfilled future self, bring them into your present. By doing that you are letting the future create your present… isn't it an interesting paradox: The future creates the present AND the present creates the future. It's both! Step 4 Use a tool that will help you stay focus. This year, I am trying a focus planner… so far it’s very helpful keeping me on track. You could also create a group of people where you meet every other week or every month and you keep each other accountable. I personally use a focus planner and it is so helpful to me to stay focus. I have a tendency to lose focus and go from one thing to the other. I want this year to be different… I want to try a new way of being: Laser Focused! We'll see how it goes! It will energetically support your creative process of bringing into your reality the life you want to live, the life that your future self is already living! Here's one of mine from some years ago. If you are not sure how to make a vision board, do a search online, it's easy. It can also be very fun to gather with friends or your family and enjoy a couple hours of dreaming, laughing, and creating! Do not forget to keep breathing along the way, be aware of the parts of you that want to keep you small, in fear, and stay where you are. Talk to these parts of you, redirect your attention to the empowered parts, towards your future self who is already living that wonderful life! Start your year with a bang! Let's make this year about taking action! One thing I have been noticing these past few months is that it's time more than ever, for us women to share our wisdom and work toward our dreams. It's time to step outside the box, to stop being people-pleasers and to speak up, to say no to what is draining and yes to what is honoring of our time, body, mind, and wisdom. It's time to trust our intuition, to fiercely cultivate joy, to make peace with money, and to receive abundance. ​What kind of action is needed from you at this point in time? What project or dream is asking for your attention? What is waking you up at night wanting to be created? Do you find yourself ignoring your heart's calling? Instead, nurture it! Feed it! Bring it into reality! Even if it doesn't seem reasonable! Especially if it doesn't seem reasonable! What have you been called to create? A new business? A new relationship to your body? A non-profit organization? A trip to a sacred destination? Having more play and laughter with your partner? Are you being called to step into your artist self? Write a book? Move on a farm and live off the grid? Open your restaurant or a retreat center or a bed and breakfast? No matter what it is, I want you to be actively creating it and I can help you kick start your adventure! Call me (480) 532-4936 or email me evelyne@coachevelyne.com to get the ball rolling! Can this be your first empowered, guided action of the year? If you are not ready for some private coaching, sign up below to have access to 12 Intentional Creativity videos that will help you get to know who you are a little better and move through fear, insecurity, and overwhelm. The layers of "Be the Mother"
This painting, titled "Be the Mother" was created as I led a client through a process of releasing old wounds, disempowering stories, and embodying the more authentic self without apologies. As you can see, the painting went through dramatic changes. Similar to what we go through in life when we wake up and say: "It's enough! There is more to life, to me than how I've been living. Time to change some things!". - Loving ourselves through it all! Be the Mother you need. Give birth to your new self again and again. Love yourself unconditionally ... not matter what. Take care of your needs ... all of them! Be curious and wonder about yourself. Acknowledge your gifts and talents. Give yourself some breaks to breathe and be. Encourage yourself with empowering words and thoughts. ​Remember that you are unique and you matter. Protect your energy and space. Feel your feelings and comfort yourself. And when it's time, be strong and push yourself out of the nest to fulfill your destiny. Know that you are worthy of love. Know that you deserve love! Know that you are loveable! Know that you are deeply loved! Self-coaching: Sign up below to access 12 Intentional Creativity® videos, at no cost that provide processes to "Be the Mother" you need for yourself on your journey. ​​Private coaching online or in-person: I have a special deal running until Feb 15th - 4 X 1hr of private coaching for the price of 2! Great opportunity if you want to integrate deeply some self-love practices into your daily life, receive powerful tools to do so, and be held in compassionate love during the process. Fill out the form below, I will be in touch with you within 24 hours. Most of the information here was taken on doTerra official website - They are much better at explaining their products. ​My experience of this one is that it makes me feel good and it gives a nice kick in my steps (is that the right expression?). I do feel more joyful and energized. And it smells soooooo good!!! The blend consists in Lavandin Flower, Lavender Flower, Hawaiian Sandalwood, Tangerine Peel, Melissa Flower, Ylang Ylang Flower, Elemi Resin, Osmanthus Flower, and Lemon Myrtle Leaf essential oils. Diffuse Elevation to promote feelings of self-worth while also helping to lessen restless feelings. A Sneak Peak Into What's Coming Up. One of my most favorite tools, one I've used since I was really young, contributed to a happy, fulfilled, and exciting life. I certainly have experienced hardships and challenges but because of this tool, I have been able to move through these with hope and trust. This tool is called Visioning Your Awesome Future. Over the last several years, I have offered different guided visionings in my newsletter and in my series of joy emails. However, I have never explained the idea behind it; the core concepts that make this tool powerful for healing and manifesting. I know that for some people it's important to know the why and how - I have some people in my family like that, so I understand . Did you know that you already visit your future many times a day? Which one are you most often connecting to? The mediocre, the good or the awesome one? If you are not intentional, your brain most likely visions the awful or mediocre future by default, which creates anxiety, worry, fear, and depression. What would happen if you redirected your mind to imagine an awesome future instead... how would that impact your present life? 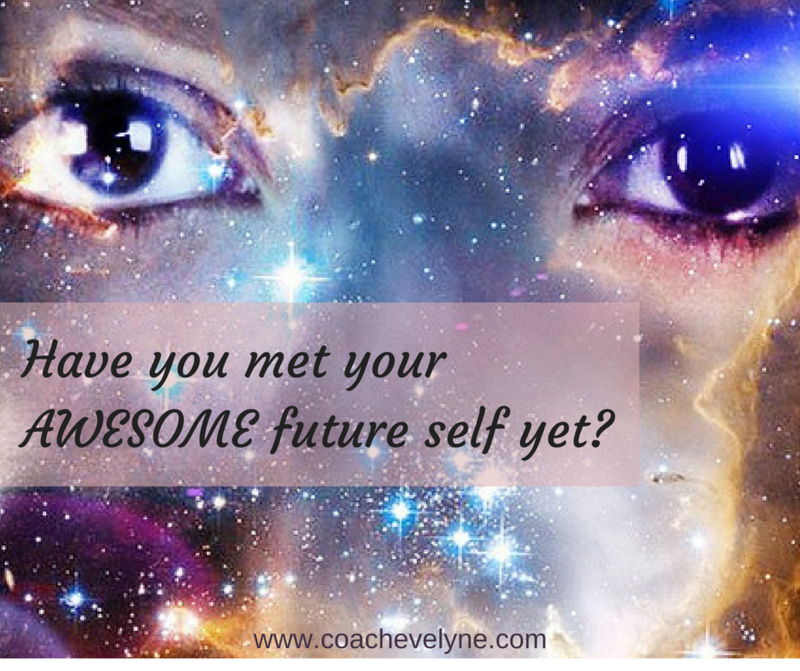 And what if this awesome future self could give you some guidance toward the next step in the present? This visioning is designed to specifically around Resurrecting Your Creative Life. It's only around 7 minutes long. I hope you like it and I am looking forward to hearing from you. 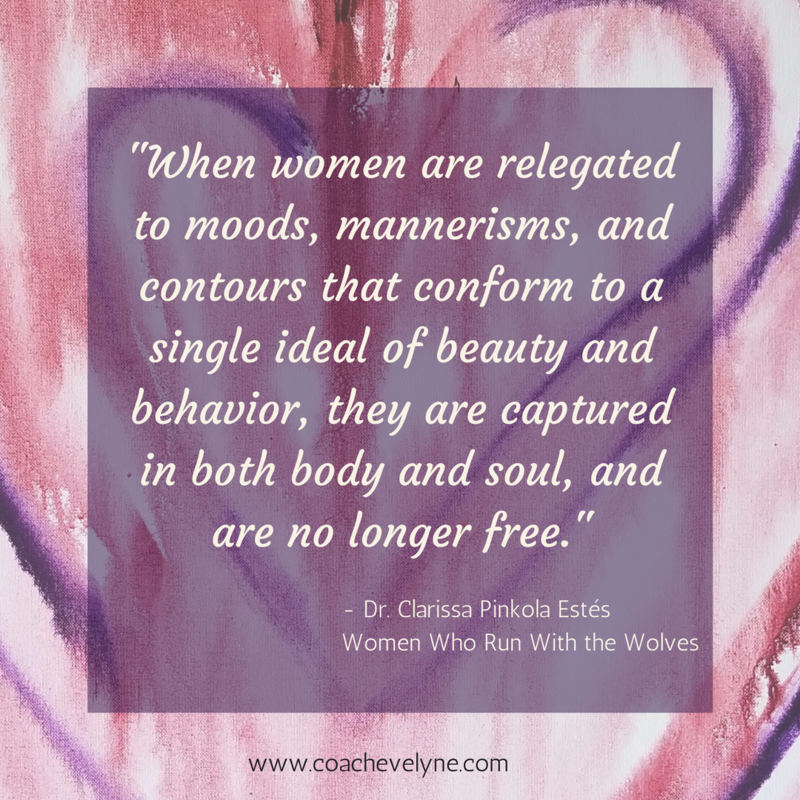 Can you think of instances where you have been relegated to moods, mannerisms, and contours? What was your first reaction? How has it impacted your life and how you've been showing up in the world? Changing the way we think and feel about our body takes time, dedication, self-forgiveness, and love... so much love! On November 14, 21, and 28, I will run a three-week Wild Woman Circle where we will study Chapter 7 of Women Who Run With the Wolves. You will also process the information from your reading and integrate new ways of thinking and being with your body on a canvas. If you want to heal your relationship with your body, learn to listen to it, love it and appreciate it, join me for this powerful journey!